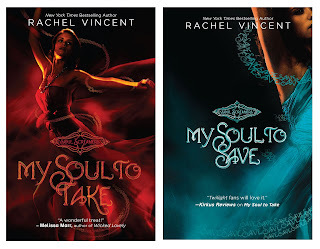 The Compulsive Reader: Contest: Win the Soul Screamers Books! UPDATE: I apologize for the typo in the post--this contest ends the 14th of February, not the 14th of January! Enter away until then! Click here to get the prequel, My Soul to Lose, free! And now, the fun part! Free books! Note that this contest is open to US residents only, though if you live out of the country but have a friend in the US we can send it to, you can enter! This contest will run until the 14th of February! Comment below to enter! Good luck! I have a questin - how come it ends on the 14th of Jan since you posted about it on the 31st of Jan? Please enter me if the contest is still running. these books sound really good. I would be excited to win. Well if it's still running I want to enter!! Sorry to everyone for the confusion! The contest is open until the 14th of February, not January! I've been wanting to read these! Please enter me. Great covers! Please enter me. These books sound kinda creepy, but good! I'd love to enter! I would love to win! I've been hearing lots of good things about this series and it would be great to be able to read it, thanks! I've heard great things about this series. I love The Shifter series. I really liked this series-- I thought the sequel definitely showed her growth as a writer! I would love to get my hands on copies! Thanks for giving us this wonderful opportunity to win free books! These books look really good! I'd love to be entered! Thank you! !